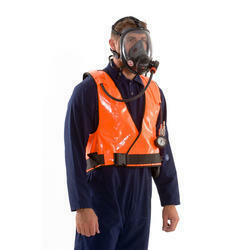 Wholesale Trader of a wide range of products which include gas mask respirator. Weight Less than 7.5kg including cylinder and mask. With thorough industry knowledge, we are engaged in manufacturing, supplying and exporting a wide range of Gas Mask Respirator. This is extensively used across the nation in gas and water treatment plants. Our range of air breathing apparatus is widely acclaimed for complete protection against toxic gases and chemicals providing a free flow of air. Moreover, these are applauded in the market for their light weight, flexibility and high level of comfort. Looking for Gas Mask Respirator ?